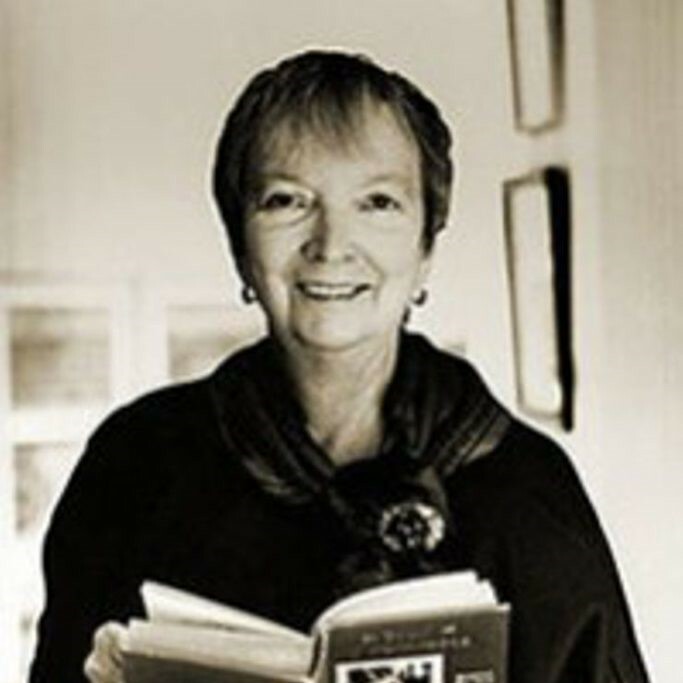 Madeleine L’Engle Camp (November 29, 1918 – September 6, 2007) was an American writer of young adult fiction, including A Wrinkle in Time and its sequels: A Wind in the Door, A Swiftly Tilting Planet, Many Waters, and An Acceptable Time. Her works reflect both her Christian faith and her strong interest in science. L’Engle determined to give up writing on her 40th birthday (November 1958) when she received yet another rejection notice. “With all the hours I spent writing, I was still not pulling my own weight financially.” Soon she discovered both that she could not give it up and that she had continued to work on fiction subconsciously. The family returned to New York City in 1959 so that Hugh could resume his acting career. The move was immediately preceded by a ten-week cross-country camping trip, during which L’Engle first had the idea for her most famous novel, A Wrinkle in Time, which she completed by 1960. It was rejected more than thirty times before she handed it to John C. Farrar; it was finally published by Farrar, Straus and Giroux in 1962. In 1960 the Franklins moved to an apartment (sold by the estate for $4 million in 2008), in the Cleburne Building on West End Avenue. From 1960 to 1966 (and again in 1986, 1989 and 1990), L’Engle taught at St. Hilda’s & St. Hugh’s School in New York. In 1965 she became a volunteer librarian at the Cathedral of Saint John the Divine, also in New York. She later served for many years as writer-in-residence at the Cathedral, generally spending her winters in New York and her summers at Crosswicks. During the 1960s, 1970s, and 1980s, L’Engle wrote dozens of books for children and adults. Four of the books for adults formed the Crosswicks Journals series of autobiographical memoirs. Of these, The Summer of the Great-grandmother (1974) discusses L’Engle’s personal experience caring for her aged mother, and Two-Part Invention (1988) is a memoir of her marriage, completed after her husband’s death from cancer on September 26, 1986. L’Engle’s A Wrinkle in Time was adapted to a film twice by Disney. A television film, directed by John Kent Harrison, premiered on May 10, 2004. When asked in an interview with Newsweek if the film “met her expectations”, L’Engle said, “I have glimpsed it. … I expected it to be bad, and it is.” A theatrical film, directed by Ava DuVernay, premiered March 9, 2018. In addition to the numerous awards, medals, and prizes won by individual books L’Engle wrote, she personally received many honors over the years. These included being named an Associate Dame of Justice in the Venerable Order of Saint John (1972); the USM Medallion from The University of Southern Mississippi (1978); the Smith College Medal “for service to community or college which exemplifies the purposes of liberal arts education” (1981); the Sophia Award for distinction in her field (1984); the Regina Medal (1985); the ALAN Award for outstanding contribution to adolescent literature, presented by the National Council of Teachers of English (1986); and the Kerlan Award (1990). In 1985 she was a guest speaker at the Library of Congress, giving a speech entitled “Dare to be Creative!” That same year she began a two-year term as president of the Authors Guild. In addition she received over a dozen honorary degrees from as many colleges and universities, such as Haverford College. Many of these name her as a Doctor of Humane Letters, but she was also made a Doctor of Literature and a Doctor of Sacred Theology, the latter at Berkeley Divinity School in 1984. In 1995 she was writer-in-residence for Victoria Magazine. In 1997 she was recognized for Lifetime Achievement from the World Fantasy Awards. L’Engle received the annual Margaret A. Edwards Award from the American Library Association in 1998. The Edwards Award recognizes one writer and a particular body of work for a “significant and lasting contribution to young adult literature”. Four books by L’Engle were cited: Meet the Austins, A Wrinkle In Time, A Swiftly Tilting Planet, and A Ring of Endless Light (published 1960 to 1980). In 2004 she received the National Humanities Medal but could not attend the ceremony due to poor health. L’Engle was inducted into the New York Writers Hall of Fame in 2011. In a 2012 survey of School Library Journal readers, A Wrinkle in Time was voted the number two children’s novel behind Charlotte’s Web. In 2013, a crater on Mercury was named after L’Engle. Sarah Arthur serves as host of The Madeleine Podcast (on Podbean and iTunes) and co-director of the L’Engle Conference. Her award-winning A Light So Lovely: The Spiritual Legacy of Madeleine L’Engle includes a foreword by Madeleine’s grand-daughter Charlotte Jones Voiklis.